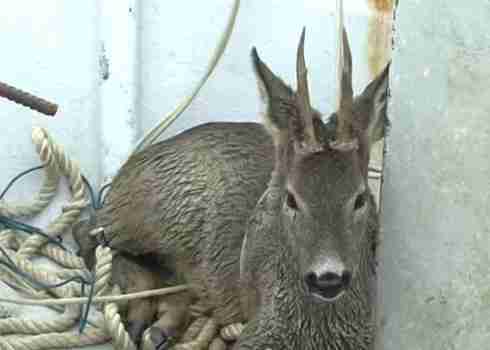 A friendly fisherman piloting his small vessel off the coast of Italy made the catch of a lifetime - reeling in a roe deer who had somehow gotten himself lost far out to sea. Enrico Di Francesco was about a half-mile out from the port village of Giulianova when he spotted what he thought was a floating tree trunk. It was only as he drew closer that he was shocked to discover it was, in fact, an exhausted animal who seemed very much in need of a helping hand. Fearing that the deer might drown, Francesco decided to give him a lift back to shore, so he hoisted him aboard the boat. "It was not an easy catch," he told Italian media. 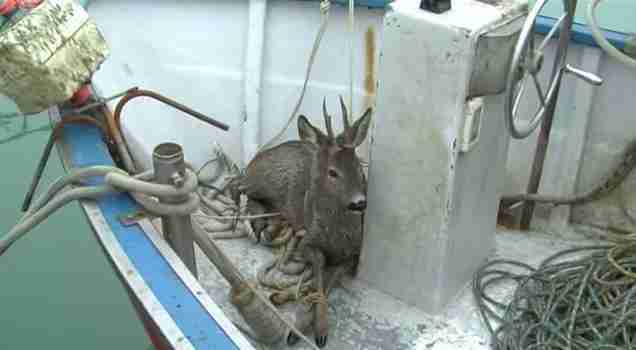 Francesco alerted authorities and headed back to port with the deer. After snapping a few photos, as is custom with such memorable catches, he handed the deer over to wildlife officials, who released him back into the forest, reports CityRumors.it. Thanks to the fisherman's kindness and compassion, the deer is once again safe and sound on dry land - a happy ending to a rather perplexing tale. "Where he comes from I do not know exactly," said Francesco. "I just hope he's all right now."